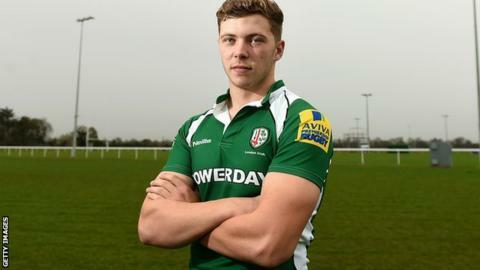 London Irish have extended the contract of teenage fly-half and England under-20 international Theo Brophy-Clews. The deal will keep Oxford-born Brophy-Clews, 18, a graduate of Irish's academy, at the club until 2018. He has made two Premiership appearances as a replacement for the Exiles this season but is set for more chances with fellow fly-half Chris Noakes injured. "We're proud of the progress Theo has made in a short space of time," Irish coach Glenn Delaney told BBC Sport. "Having come out of the academy system and school last season to make his debut on the bench against Northampton has shown that if you're good enough, you're old enough," Delaney added. "We're very pleased that he's going to be with us for the foreseeable future."